When I was six the world began to spin. At first it only happened for short amounts of time, 20 minutes, maybe an hour. I had trouble describing the spinning. It wasn’t quite like I was spinning and it wasn’t quite like the world was spinning. The best explanation I could come up with was that my brain was spinning around inside my head, and as nonsensical as that seems, it wasn’t the strangest part. The strangest part was that it only happened when I was standing. As long as I was laying down or sitting up I was fine, but the minute I stood up everything went wrong. My parents took me to the pediatrician. The pediatrician determined that I didn’t have a fever. The pediatrician determined that I didn’t have a rash. The pediatrician determined that I wasn’t throwing up. The pediatrician decided that I was fine. She asked me to stand up and I started crying because of the way the world spun. She told me that I was anticipating the spinning, that I was only crying because I thought there would be discomfort, not because there actually was. She told my mother that I was lying, that if my mother, who had carried me in because of my discomfort, left me sitting in the waiting room I would get up and follow her out and stop pretending something was wrong. Here’s what the pediatrician didn’t do. She didn’t consider that I might be telling the truth. If she had done a basic examination, if she had checked my heart rate and blood pressure, she would have noticed that my heart rate while laying down was at least 30 beats per minute slower than it was sitting up or standing. She might not have known what it meant, but she would have known enough to recommend that I see a cardiologist. Photo Description: A young person wearing a hat smilling at the camera. In the background are several large trees. SJ is a Junior and an English Major at Mount Holyoke College. 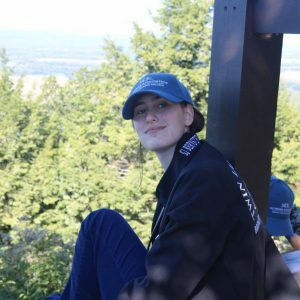 She also does work for Mount Holyoke’s Accessibility Services department, Co-Chair’s MHC’s Jewish Student Union, and is the Social Chair of the College’s Coalition For Asexual/Aromantic Awareness. Over the years I stopped going to doctors when I was sick. I still saw doctors, but I only went to appointments I was healthy. There was no point in going when I was sick. They exacerbated my pain and discomfort and for what? The doctors couldn’t magically fix me. They didn’t even know what was wrong. All they could do was try new medications that would take weeks to build to an effective dosage, if they worked at all, and write me another round of doctors’ notes for school, and shake their heads at my mother for humoring me by letting me stay home so often. My chronic migraines emerged about two years after the dizziness did, and every doctor was quick to tell me that the vertigo was just a side effect of the migraines, yet somehow, I didn’t think it was. I couldn’t fully explain how I knew, but it just felt different somehow. One thing they had in common though, they both got worse with every year that passed, hours turned into a day and then into multiple days and days turned into a week. By middle school there were times when I would go two whole weeks without attending school or seeing my friends or getting out of bed. Needless to say my grades suffered for it, and both my teachers and the administration accused me of faking. My freshman year of high school I missed so much that only got a singular credit and had to retake most of my classes. A few minutes later my neurologist came in and informed me that I had P.O.T.S, Postural Orthostatic Tachycardia Syndrome, the reason for the debilitating episodic positional vertigo that I had been experiencing since I was six. She sent me to a cardiologist and I got my official diagnosis from him a few months later but the damage had already been done. I had gone undiagnosed for 13 years, 13 years of people doubting that my disability was real, of the school insisting that I was faking it, of being afraid to tell anyone that I was feeling unwell yet again. 13 years in which I failed my freshman year of high school and pushed my body in ways that greatly increased my symptoms, because I didn’t know any better. If my pediatrician had believed me even a little, even enough to do a proper examination and put a blood pressure cuff on my arm, I would have gotten my diagnosis and started trying medications and figuring out how to manage my disability when I was six instead of as a sophomore in college. But that’s not what happened, because the pediatrician didn’t believe me. As difficult as it is for adults to find doctors who believe them and who run the tests that need to be run it’s even harder for children, because it’s so easy to dismiss a child, to say they are just trying to get attention, that they’re exaggerating, that they’re faking it. But adults don’t have a monopoly on the chronic illness market and it’s worth considering that if a child says that something’s wrong, then maybe, just maybe, they are telling the truth. « YOUTH PROGRAM AT THE DAYLE MCINTOSH CENTER IS A SUCCESS!